Sur une ancienne ferme de la colline (murs épais so cool) avec vue imprenable sur les collines toscanes. Une grande partie (150m2) d'une Casa Colonica (ferme). Propriété de luxe avec vue imprenable sur un village médiéval. Piscine. 4 chambres, 2 salles de bains, cheminée. Famille très sympathique, 2 lits bébé et 2 chaises hautes. Grand salon avec cuisine ouverte, cheminée et grande terrasse privée. Satellite avec écran plat et un lecteur DVD. Piscine avec divers (LIE) lits et un canapé. Villages à proximité comme Panzano et Greve Montefioralle avec de bons supermarchés, des restaurants et des terrasses. Marché les samedis et dimanches. Vous pouvez aussi visiter Florence et Sienne (à la fois 30 km). Des sentiers de randonnée directement à partir de la maison. En été, vous pouvez utiliser le grand jardin potager. Les propriétaires sont parfois présentes dans la maison à l'étage (non loué). Il ya un chemin privé de l'appartement à la piscine. We couldn’t believe it when we arrived at this place, stunning views and so peaceful, Villa well appointed very clean. and met all our needs. After a stressful journey we quickly unwinded and enjoyed our stay. We spent all our time outdoors in the evenings enjoying the wonderful sunsets. Panzano and Greve were ideal for shopping. Only downside is the bumpy and rough road that lead to villa but that didn’t deter from our great holiday. Thank you Tessa for our bit of heaven. Stunning location and beautiful well equipped villa. We stayed as a group of 6 and 1 baby and it was fantastic. They provided a travel cot for us, a high chair was also available, so it was good for kids. The only down side from a child perspective was no bath, so lots of bath time in the sink! We hired Simona the chef one evening who was great! The views were great and the pictures don’t do it justice, the only downside as others have mentioned is the road- it is really rough! We had a Toyota Yaris and a Golf between us that managed it, but we had to go very slow! The rural location is stunning but you do need a car, we walked to Greve a couple of times and it was a good 35-40 mins walk and very steep! Beautiful views all the way but probably not doable at night! Fantastic villa - highly recommend! Casa Panzanellino is everything we were hoping for and more! There were 3 couples in our group and the villa was clean, spacious (we had a bedroom spare) and very well equipped with everything we needed. The outdoor space, the patio, the pool and the stunning views of the Tuscan hills was the perfect place to relax with a glass of wine in hand. The highlight of our stay was having Simona (who Tessa very helpfully coordinated everything with) come to the villa and prepare a meal. The food she prepared and the way it was delivered was absolutely fantastic and really added to our stay! Though Im back to work now, Im already dreaming about when we could go back to Panzano and Casa Panzanellino! Turing off the main road the approach to the house passes olive groves and when we were there in May myriads of wild flowers. The view is breathtaking down the valley where perched on a hill as in a film decor is the mediëval village of Montefiorella. The blue hills towards Florence stretch into the distance. The age-old renovated farmhouse with its swimming pool and terraces sits perfectly in the tranquil surroundings. The accommodation is superlative with a large well - furnished sitting and dining room and a kitchen with all modern appliances .The beds in the four bedrooms are very comfortable and the bathrooms clean and modern. 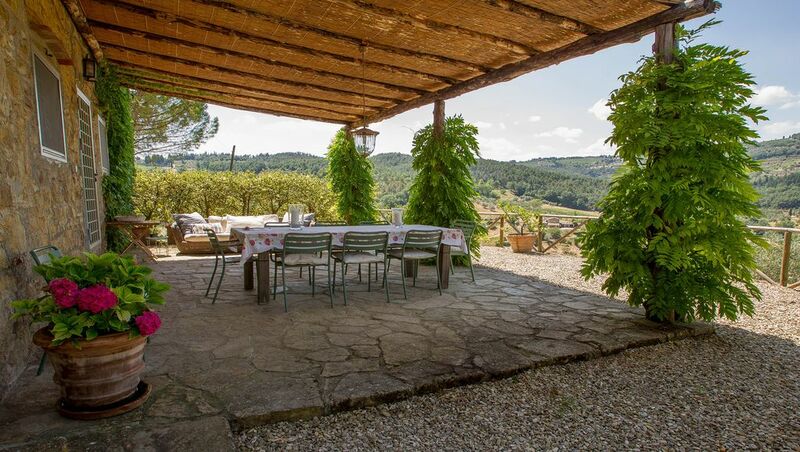 Outside is the loggia which encompasses the incomparable view where one can sit at the long woorden table with a glass of Chianti Classico and watch the swallows skimming through the balmy air. The large pool is well maintained and beautifully situated surrounded by comfortable chairs and lounges..
We can heartily recommend a stay in this well-maintained and wonderfully situated holiday paradise. Thank you very much for your lovely words! We stayed here as a group of five to celebrate my fortieth birthday all the way from Australia. Much stress went into choosing the perfect villa for the group for the week together in Tuscany/Chianti. Driving through the Tuscan hills to the villa from Pisa on the day of arrival I think we all had tears in our eyes, on arrival I knew it was going to be perfect and exactly the stay/trip we had been planning for ten years. The house is very comfortable, pool is beautiful, views amazing. We would recommend an SUV to access via the gravel road for comfort and ease, we had an Audi wagon and Alfa Giulietta both of which bumped and scraped a little. Tessa is amazing to deal with for arrangements and helped me arrange the most amazing experience for my friends to help celebrate by arranging a local chef Simone and her husband to cook the most amazing meal ever..
My only request would be more pillows for the beds if I was to pick anything at all. Waarborgsom 250 euro (bij weekhuur). Prijzen zijn incl. linnengoed, handdoeken en eindschoonmaak. In geval van een kortere periode wordt er 100 euro schoonmaakkosten gerekend. Van 1 oktober - 15 mei zijn de prijzen exclusief gasverbruik (gasmeter), inclusief openhaard hout & oliekachel. PayPal betaling mogelijk.